What Would Be Your Dream Teen Titans Series? With all the buzz with the new Teen Titans series coming next year (or simply called Titans) and speculation of that comes with it, I've decided that for the fourth in, "your dreams" series will be about your dream Teen Titans team. You've been tricked! Quan Chi stole your idea and tries to push you into oblivion. You however are able to dodge it, but due to your weaken state, fall into a random portal. Suddenly, you find yourself falling to earth. knowing it is the end you begin doing your best Point Break reenactment. This is put short as you are saved by Starfire who happened to be in the area. Once safe and on the ground, you explain to her everything that's happened. She agrees to help you and brings you to Titan tower. While there, Beast Boy and Kid Devil come to you and ask you to help them with there pitch to a TV company about an adaptation of there adventures and ask for your advice. What would be your dream Teen Titans series be? Who would be your cast (or at least your starting cast) and who would lead. Would you have one of the Robins, Aqualad or someone else? Where would it be located? Would you keep Titan tower or use somewhere like the old Titan Cave? What tone would you want your series, would it be serious and dark? gritty and light (a combination few would dare take) or some other type of tone? What style would you like it in, animated, anime, live action etc. Would you retell old titan stories or try something new? 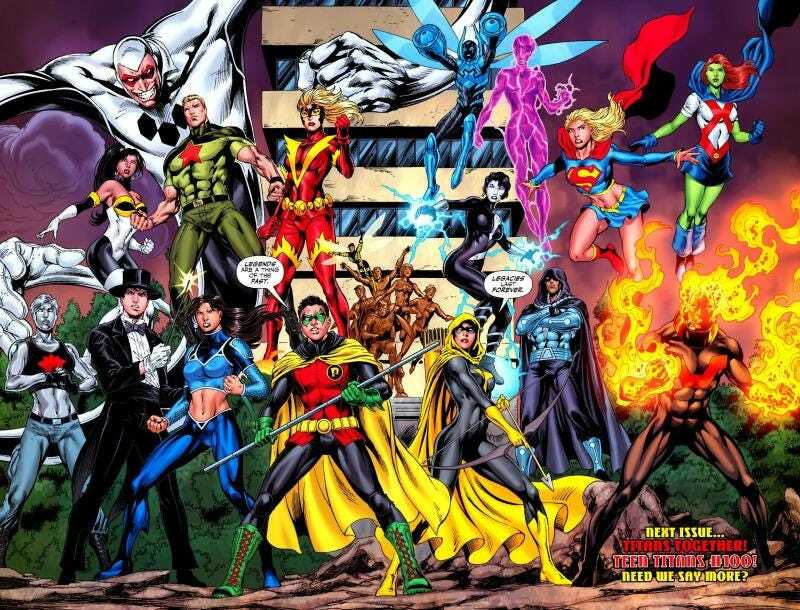 What eras of the Teen Titans would be your main insperations? Team: Nightwing (leader), Wonder Girl (Cassie Sandsmak, second in command), Kid Flash (Wally West), Starfire, Beast Boy and Blue Beetle (Jamie Reyes). Inspired mainly by the 80s New Teen Titans and the early 00s Titans comic, I would use the Titan Cave (at least to start) and a tone similar to cowboy bebop and other Shinichirō Watanabe series filmed in live action.